A North Carolina grand jury has decided not to charge the trigger happy cop who gunned down an unarmed black man who’d gone looking for help after a car crash. Although the ‘officer’ was arrested last year and charged with manslaughter, it looks as if might escape punishment after taking an innocent black man’s life. The grand jury found that there wasn’t enough evidence to indict Officer Randall Kerrick with felony manslaughter and asked that the prosecutors refile with lesser charges. The prosecutors says they will resubmit charges since only 12 of the 18 grand jury members were present for the vote. Prosecutors did not reveal whether they would resubmit with lesser charges or try again for the felony charge. 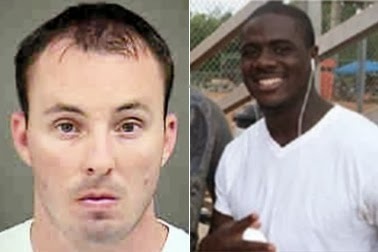 Officer Kerrick gunned down former Florida A&M football player Jonathan Ferrell after Ferrell crashed his car and went looking for help. A homeowner called 911 after Ferrell knocked on her door, but when police arrived they killed Ferrell instead of helping him. When Ferrell walked toward the officers, Kerrick unloaded his weapon into the 24 year old. Kerrick is happy that the jury found that he did nothing wrong when he unloaded his weapon into Ferrell. “He’s extremely relieved that the grand jury members saw fit to keep an open mind and not listen to all the propaganda on all the things he did wrong,” reports NBC. Ferrell’s family has filed a wrongful death lawsuit against the police department, explaining that Ferrell had no weapon, was injured, and never posed a threat to Officer Kerrick.